Well, I have just about made it to race day. Having made it through the (often) dreaded 20-mile training run, I am now officially in tapering mode. At this point, I have done all that I can to get to prepare for race day, and that is reassuring. Unlike most runners, I look forward to the tapering period. It's kind of like a mini-vacation. Yesterday's 20-miler went well, for the most part. We have had a major heat wave the past 10 days or so, and yesterday was one of the hottest days I can remember in my lifetime. I got up around 4:45 AM to have time for some breakfast, caffeine (chai latte'.....I can't do coffee), and energy chews. It was a bit strange leaving the house in the dark, but also a nice change of routine. I live a couple blocks from the Grinnell College campus, and the central campus is well-lit with street lights and its perimeter is an exact mile. I set out with the plan to run 3-4 laps around this area until daylight appeared, then I would venture elsewhere. It was already warm and humid, at 5:40AM, so I knew it would be even more muggy when the sun came up. The first few miles felt great. I didn't have any stiffness or fatigue (despite the early hour), and I was surprised to see the daylight getting brighter every few minutes. After just one lap it was substantially brighter, by the time I finished the third lap daylight had appeared. I decided to run out to a park, which was a mile down the road, and do a couple laps on the bike/walking trail. That put me at 6 miles, so I headed back to my house...7 miles. I grabbed a quick glass of water and reassured the youngest daughter I'd be back in a bit to take her to school...I may be a marathoner-in-training, but I am still (more importantly) a mom, and I refuse to compromise that role. I ran a quick 2 miles and returned to the house. I grabbed some Gatorade, and made a peanut butter/rice cake to eat while enroute to her school. It felt good to know I already had 9 miles done, and that I was almost to the halfway mark. The school drop-off took about 15 minutes, and before I knew it, I was back on the road...heading out for a 6-mile segment. This part of the run, was definitely the hardest physically, but more so mentally. By then, the sun had risen and it was really hot and sticky. I was on a 6-mile out and back route I have run several times this summer. I have run it on every one of my long runs in some combination with other routes. There is some shade in the first 2 miles (and in the final 2 returning miles), but those 2 miles in the middle are on the open road in the sunshine. These 2 miles are on a some-what busy road, so I usually just run alongside on the gravel shoulder and stay completely off the pavement. I could really feel the affects of the gravel and dirt yesterday. I could feel my feet slipping and sliding, so it took more effort than usual to keep my balance. I made it out to the turn-around, mile mark 12, and headed back into town. Despite the heat and extreme humidity, I was able to keep a consistent 10-minute pace. Upon reaching the 14-mile mark, though, I could really feel some fatigue creeping in on me. I was such a sweaty mess, my shirt was really starting to annoy me. It was a tech shirt, but with the humidity preventing most of the dampness from evaporating, it felt like a heavy wet blanket. For a brief moment I considered just quitting after I reached mile 15 because I was feeling so miserable......then, instantly I thought, "NO! Don't even think about stopping, you'll have to do this all over again if you don't finish 20 miles today!" So, I allowed myself to have a few quick walk intervals, then finished the 15th mile. I headed back home for a bit to grab some more Gatorade. I considered changing into a clean (dry) shirt, but decided against doing so...I won't have that option on race day afterall. So, I headed back out to finish the 5 remaining miles. It was progressively getting more hot and humid., but I pressed on. I was relieved to have those previous 6 miles done, and only having 5 remaining miles didn't seen so daunting. I probably looked like a lunatic because I kept zig-zagging back and forth on the street to stay under the shade of the trees. Miles 16, 17 and 18 felt alright...still on pace. During the final two miles, I did allow myself a few more walking intervals. I figured it if was race day, I'd do the same. This kind of heat (and humidity) is no place to prove your heroism (or stupidity)...if you don't respect it and slow down, you could collapse and not be able to finish at all. I finally made it back home, all 20 miles were finished! My finish time was 3:22. Even with several walking breaks, I still averaged around a 10-minute pace. 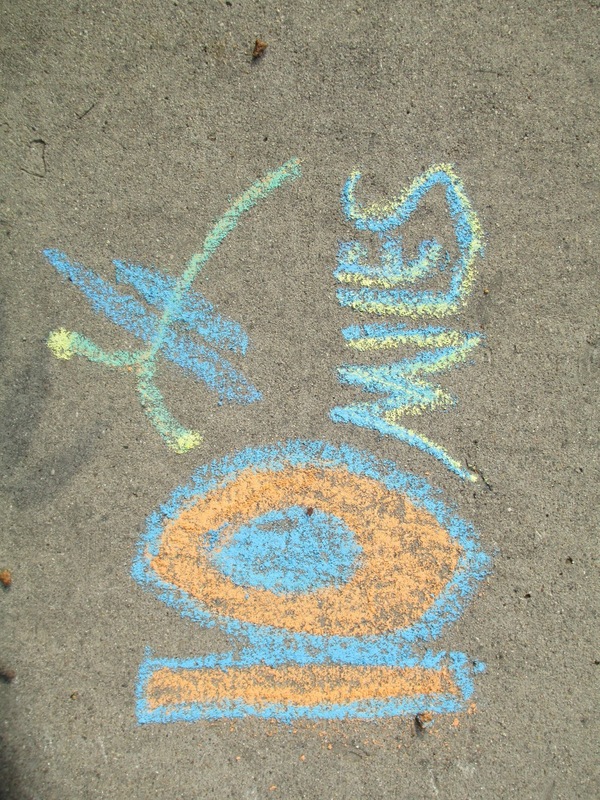 So, how do I feel about yesterday's 20-miler? 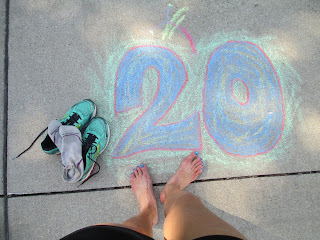 I'm disappointed that I had to walk a few times, but I am very proud of myself for doing 20 miles! I have to keep reminding myself that these are training runs. These runs are there for us to train ourselves to not only run farther and farther, but also to run when we don't think we can go one step farther. I can not control the temps or weather on race day, but I can control choosing to train in ALL conditions. Come race day, this 20-miler in the extreme heat and humidity will be worth every step. Could I have pressed on and ran 6.2 miles farther yesterday? Probably, but I would have a needed to walk some, no doubt. When the actual event takes place, there will be crowd support and fellow runners and water along the route...all of which, I believe, will make those final 6.2 miles more bearable. Physically, I really didn't notice any muscle fatigue, and I don't have any soreness or stiffness today. I'm really liking this recovery! So, onward! 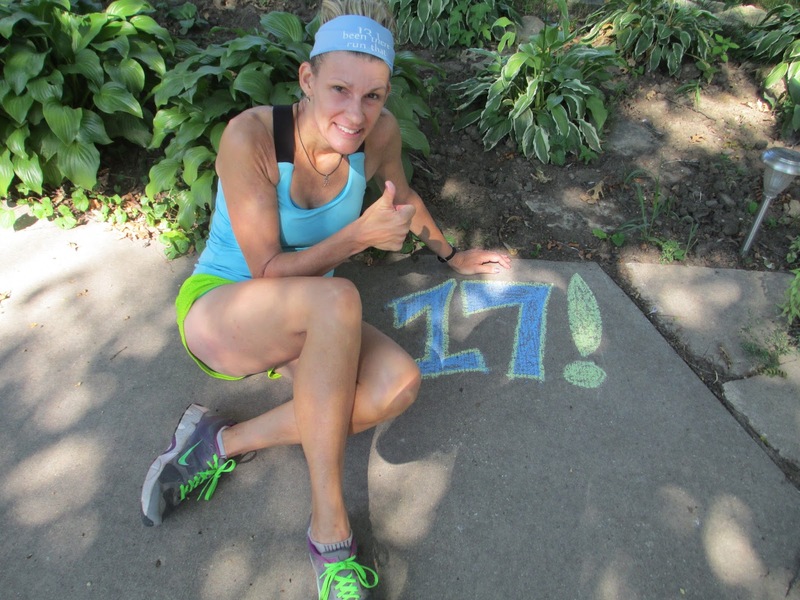 Three weeks until the Quad Cities Marathon! I cheated today. Well, not REALLY, but I feel like I did. I have been running like crazy this summer, prepping for my first big 26.2 on September 22nd. August has been brutal with three long runs of 15, 17 and 18 miles on three consecutive weekends. This weekend, I "only" had 10 miles on the agenda, and those 10 miles (almost) felt like nothing compared to the previous long runs. 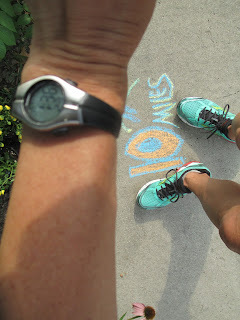 Marathon training really can mess with your head, at least that is my experience with it. I am doing a fairly low-maintenance training schedule (running no more than 4 days each week) and I"m not killing myself with a lot of speed work. As I have said in previous posts, I am not super fast. I average an 8:30-8:45 pace on a good day, which is still pretty respectable given the fact that I am not blessed with many natural athletic abilities (I am tall, klutzy and have big feet that are very easy to trip over). All of the experienced marathoners and training plans I researched have cautioned that your marathon pace will be slower than your shorter-distance pace. So far, I have been averaging a pretty consistent 10-minute pace on my long runs. I have run several half marathons/20K's, and my pace for those is usually between 9:00-9:30, so I seem to be on track with my pacing. Although, I'd much prefer to have my long runs be a little faster-paced, it is to my advantage to keep them where they are and not try to be a hero (or a show-off). Great! It was a bit warm and humid, but there was a nice breeze. I ran the 10 miles in 1:36:23 (around a 9:30 pace), and ran it with a negative split (which is my goal in every run, no matter the distance). I have had so many runs recently with a 10-minute pace, it was reassuring that I still can pull off a 9:30 pace for a substantial distance. I tried using moleskin for the first time today. I have heard it is good for blisters and/or callouses. I haven't had many issues with blisters, but I do have a callous on the ball of my right foot. It's been there forever, and never really gives me problems but it feels a little funky after a long run. Today, I put a piece of moleskin on that to give it some cushioning and protection, and I think it helped! I also wear wool socks for my long runs (anything over 5-6 miles). They wick the moisture away from the skin, which is probably why I don't have many problems with blisters. My training is winding down, yippee!!!! I have a 20-miler next weekend, a half marathon the following week, and then tapering for the remaining two weeks leading up to my first-ever marathon. It's hard to believe it is almost here. Just a few months ago, I never would have imagined I'd be experiencing this once-in-a-lifetime event. I saw somewhere that less than 1% of the human population will ever do a marathon in their lifetime, and I will be part of that 1% in 29 days. Winning isn't everything...unless it's a GrAnD GiVeAwAy!! 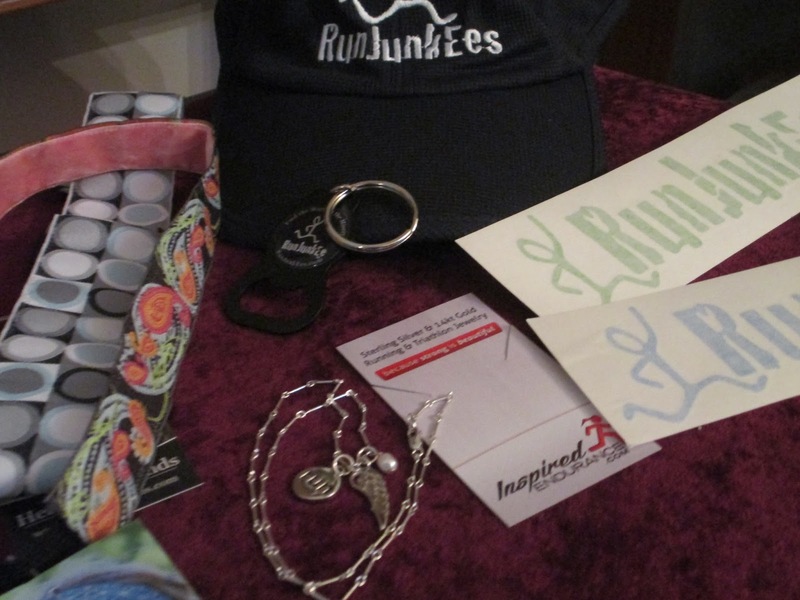 Kimberly Dafoe Smick, you are the GrAnD GiVeAwAy winner!! You have until 10PM CST Friday, August 16th to claim your GrAnD prize(s). Please send me a message via Facebook or an email to runningonthefly@gmail.com. Once I have your contact information, I will get the goods in the mail ASAP. ;-) CoNgRaTs!!! My big day is approaching, in 6 weeks. Surprisingly, I don't feel nervous or worried...yet. I was a little panic-stricken four weeks ago, though, following a tumble on a trail run. The mishap left me with several messed up ribs and lots of discomfort for the first couple weeks. I wasn't able to do my daily push-ups or planks, and rolling over in bed almost made me scream. And sneezing or blowing my nose was absolutely worse than the labor pains of child birth. Seriously, it was THAT bad. Thankfully, though, I was able to run and continue to train for my marathon. Despite the ongoing pain in my rib cage, my lung capacity did not seem affected. There has been some discomfort when I pump my arms while running, and I think it may have slowed my pace slightly, but I have been able to stay on schedule with my long runs. I found a program online, Senior Marathon Training Program by Hall Higdon. No, not (necessarily) for senior citizens, but for advanced runners....runners who have been running for several years (therefore, having a solid "established" running base) and also for those who have done half marathons (have trained for previous long distance events). Perfect fit. It was a 16-week training plan, but I modified it to make it more of an 18/19-week plan to allow for some flexibility. I am happy with how things have worked out so far with my training. I have been blessed with great weather, so most of my runs have been able to happen as scheduled. Our family took a couple of weekend trips (on two consecutive weekends, none the less), so those long runs had to be tweaked a bit. I managed to do a 10-mile run on the Friday morning (before work) prior to the first outing, and that went well. Hoping for the good luck to continue, I attempted a 15-mile run on the following Thursday afternoon...and that did NOT go as I'd hoped. The weather was hot, the cloud cover vanished at mile 4, and my body hit the proverbial "wall" at mile 10 (due to an inadequate lunch)...UGH!! I managed 2 more miles (with a lot of walking) before I waved the surrender flag. Not all training runs (or races) will be great. I have learned to take that in stride (no pun intended). The bad runs keep us humble, and there is always something to learn from them. Ten days later, I did my 15-mile run, and it went great. That was the farthest I'd ever run, and I truly felt like I could have run farther. A week later, I set out to conquer 17 miles, but was prepared to stop after 16 if I felt fatigued. Again, the adrenaline kicked in and the endorphins carried me through the 17th mile. Just a year ago, I ran a 20K (12.4 miles) and then did a half marathon a week later...and majorly bonked. I was able to finish the half, but had to walk several times because I was still not completely recovered from the other race. It is amazing to see how much my body has adapted in a couple months to the increased distance I'm pushing it to run. The town where I live is pretty good-sized for Iowa, but very small compared to a metropolitan setting. I have a great deal of envy for fellow marathoners-in-training who have an abundance of options for parks, trails and routes. I have several routes (in various distances) that I am constantly mixing up (running a given route clock-wise one day, then running it in reverse the next time, etc.). Or, I may elect to run the 7-mile loop first, then do the short 3-mile out and back before finishing with the mini-2-mile loop (sometimes in reverse, often times not). It does get a little mundane seeing the same sights over and over, but this is where I live and this is what I have to work with. All of my training runs have been solo, too. There are not too many local people willing (or crazy enough?) to accompany me on my long runs. Yes, I have really gotten to know myself well from all the conversations in my head as I stride along. I usually have music with me, though, so my witty (or not) sense of humor isn't always the main entertainment while I'm in my running shoes. It works best for me to do my long runs on Saturday mornings, though occasionally I've done them at other times (as mentioned above). Typically, I get up before 5:00AM and have some oatmeal and a chai latte' (my caffeine fix). I spend a little time on the computer waiting for the food to digest, munch on some energy chews and have a little more water. Ideally, I'm out the door by 6:00AM, though on occasion I may get distracted by something on the computer and my start time gets delayed (my bad). I have tried carrying water with me, and it just is not my thing. The constant "ka-ching, ka-ching" of the water sloshing in the bottle is very annoying. I even tried a bottle with a collapsible liner, and that didn't help the problem. Also, I don't like the "asymmetry" of having something in one hand and nothing in the other...it leaves me feeling out of balance or something. 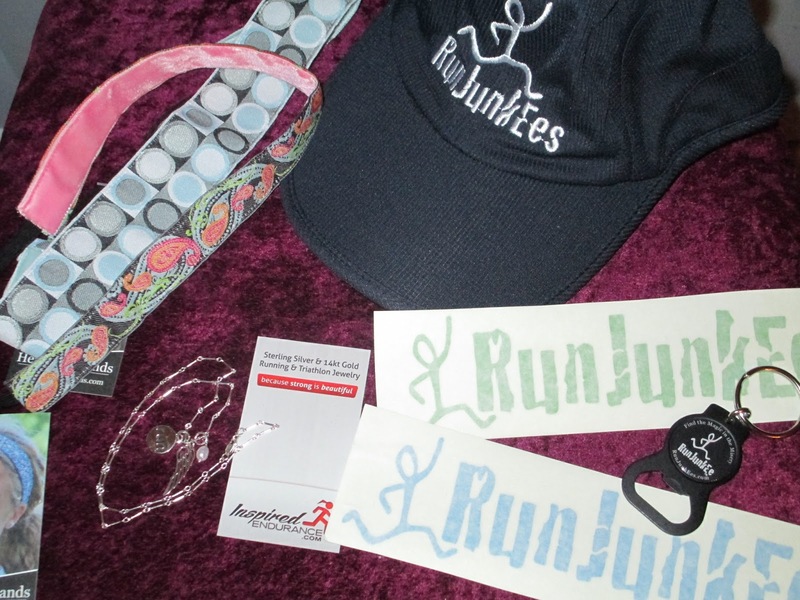 Yeah, I'm a high-maintenance runner. Since there are no porta-pots along the streets of my town, I usually run for 6-7 miles and loop back to my house anyways. This gives me a chance for a pitstop (if needed) and a chance to grab a quick gulp of water and more energy chews or gel. A lot of marathoners (probably most) would not endorse my running without water. Most of my long runs are early in the morning, though, so the summer heat has not been much of a problem. Since I'm looping back to my house periodically, I have plenty of opportunity to hydrate and refuel. Also, I know on race day there will be ample water stations along the route, so that detail is one I choose to not worry about. When I do races, I have a mini fuel belt stocked with gels and chews so I have those on hand to use as needed. This is what works for me, and has worked well over the years for the numerous half marathons I have successfully completed.. I have several pairs of shoes I rotate through for my training runs. I have "older" shoes that I use for the shorter runs, they are broken in and SO comfortable I can't bring myself to part with them. They are great for short runs, but I know I'd regret going any farther than 5-6 miles in them. I have 2 other pairs of shoes I use for my longer runs. One is a pair I've had for a year and have seen me through several races of various distances, the other is a new pair I just acquired recently. By using several pairs of old and new shoes, I get more life out of each pair. If you wear the same pair of shoes for every run, they will break down a lot faster. Shoes need recovery time in between runs just like runners do. So, six weeks to go. It's exciting and (surprisingly) not too scary. In less than 2 months I will be a marathoner. It will be strange to go back to my "normal" way of life...running a few times a week and probably not going farther than 6 miles at a time. I have three half marathons coming up this fall as well, one in a few weeks and the other two are after the full marathon. I can't decide (or maybe my body will make that decision for me) if I'm going to go all out at these half marathons and try for a PR or just take it easy and enjoy the run. I don't think every run should be a race.....we need to enjoy the experience and be thankful for being able to do so. My Facebook page, Running on the Fly has been such a fun adventure, and recently we reached the "1,000 likes" milestone.....and this calls for a grand celebration and a giveaway! First, we have these adorable head bands from Heads Up Bands (www.headsupbands.com). These are the best running/fitness/fashion accessory a gal could have. 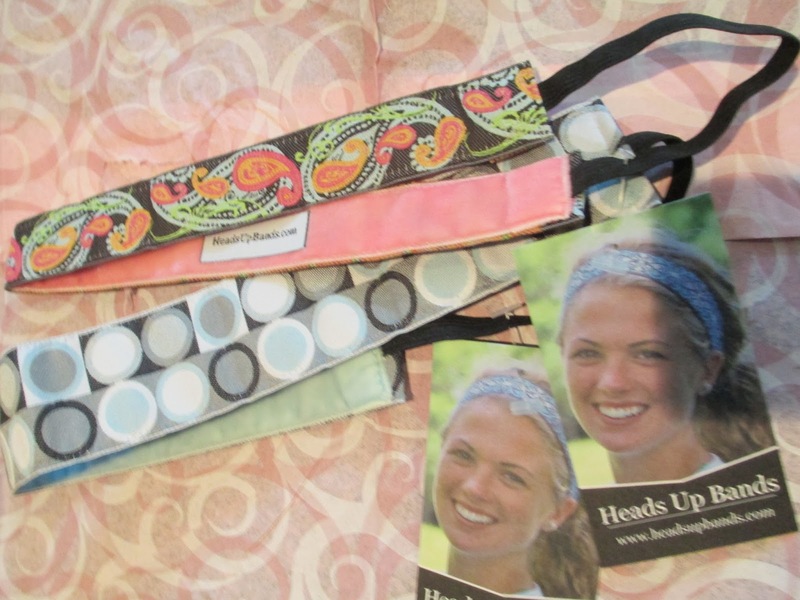 I have a couple of these headbands, and I absolutely love them. Not only do they stay in place (even after 13+ miles), but they do NOT pinch or cause headaches. And, they are available in two sizes and in many colors and patterns. The winner of the GrAnD GiVeAwAy will receive these two headbands...one is a pink/coral band with a paisley pattern, the other band is grey with a black, white and grey geometric pattern. 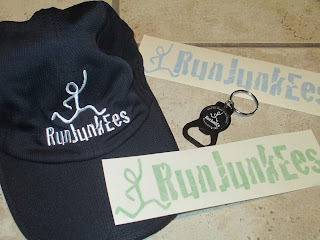 Next, we have a tech fabric running hat, from RunJunkEes (www.RunJunkEes.com). I typically prefer visors, but this is a hat I would definitely wear. It's navy blue, has the RunJunkEes logo on the front and a velcro strap across the back. It's very light weight, so it would be great for hot weather. 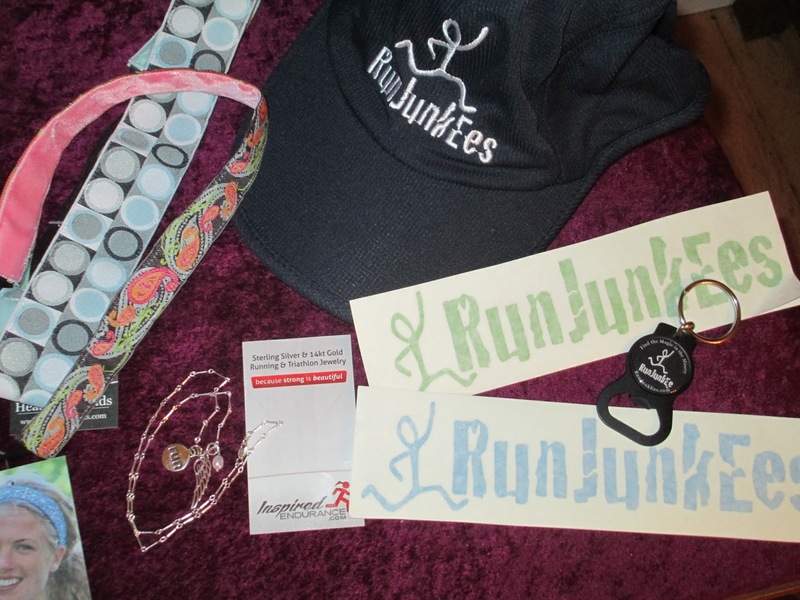 Also, they sent me a key chain with a bottle opener with their logo on it...and, who doesn't need a bottle opener? They even included two decals...one in a lilme green color and the other is royal blue. The final "big" item is this adorable sterling silver necklace from Inspired Endurance (www.inspiredendurance.com). This is a real beauty! The pictures don't do it justice. 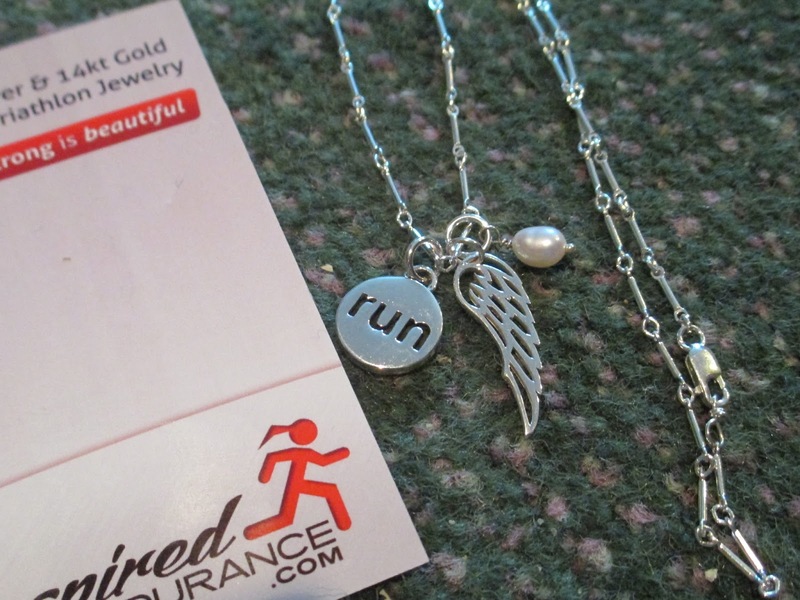 This an 18" bar necklace, which includes a Run charm, a wing pendant and a potato pearl charm. Total sweetness! There may be more items added ...so stay tuned! Also, I will be throwing in a few extra swag items. Total retail value is approximately $150.00 .